But these automated bureaucratic machines seemingly control many aspects of our lives, sending out automatic bill notices, email reminders, letters about the status of your children’s immunisation, requests for tax papers, and — oops — overdue notices on library fines. On one of our trips to the library, I spied Hans Christian Andersen, a musical from 1952 featuring Danny Kaye. With ballet sequences, fun songs and the innocence of the youth, I knew that this would be a winner with the girls. And, yes, the charm of Danny Kaye delighted the girls. The ballerinas entranced them. The songs caught their imagination, although when they sang “I’m Hans Christian Andersen”, it sounded more like “Han Chizzen Anderjen”. Are you familiar with the film? But, alas, when I received the automatic overdue notice for keeping the DVD longer than three weeks, I couldn’t find the case. The DVD was still in the drive of our computer, but the plastic case had vanished. Did one of the girls take it to their room to look at? Had it fallen behind the sofa? At this stage, I had been packing up all our books, so I had relatively few books to look through, and I couldn’t find the case anywhere. However, I felt confident in approaching the library and successfully pleading my plight because I still had the most important part — the DVD. The case is just window dressing, right? In our local jurisdiction, you don’t get fined for having books out past their loan period. (The council would prefer patrons to return the books and keep reading, rather than just stay away — an admirable policy.) However, when you have an overdue book, your account is suspended. That’s easy to get around — I quickly signed up one of my children so I could keep our borrowing habit alive. So on one of our trips to the library I took the DVD in and asked two things. Was it possible that I had previously returned the case without the DVD? (No, I guess not, but it was worth a try…) So, could I return the DVD without the case? After another week (that included some further searching that unearthed missing drink cups and the red spotted shoes I couldn’t find on Sunday morning), I approached the Head Librarian — she of the grey hair and sensible glasses who can recite the Dewey Decimal System backwards. I asked if I could return the DVD disc. “Hmmm…” She peered at me over her glasses, sizing me up to determine if my story was true. Was I just hoarding the case at home because I had taken a liking to the cover insert? A quick look on ebay showed me that I could replace the DVD for about $15. So either the library system chooses to extort their patrons or it gets ripped off by its own suppliers (probably the latter). I was in a particularly adventurous mood when I composed my letter. It wasn’t really because I needed the $15, but the principle of the whole situation — where I was trying to do the right thing and the system kept blocking my way — made me want to rebel further. I have an enquiry about the lost library item [details provided]. I actually have the DVD that goes in the case… it’s just the case that is missing. Every time I have approached the library to return to the DVD, I have been told that I must have the case too in order to return it. As the total charge for replacing this item is $33.85, and I can buy the item, new & sealed on ebay for $17, I wondered if it would be okay to purchase the item new and hand that in to the library in lieu of paying the $33.85 fine. I would like to settle this matter, as I am not in the habit of losing library loans. 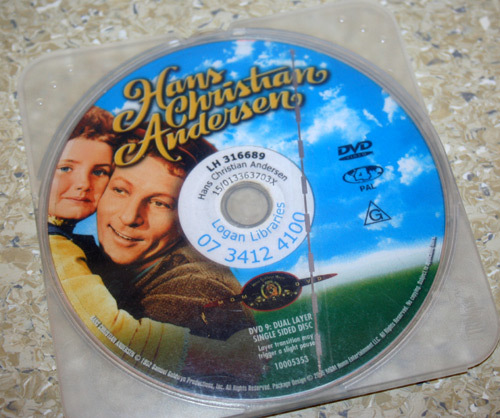 I apologise for you experiencing such difficulty in returning the ‘Hans Christian Anderson’ DVD. If you have still not located the case please bring the disc into [a specific library] and ask to speak to the librarian. We will sort this for you. There is no need to buy a replacement copy. That sounds easy, I thought. And it was. I drove into the appropriate library, spoke to the appropriate person and now I have a clean record again. So bureaucracies are human, you see. You just have to find the human in them to talk to! More recently... Look who's here! maybe I should’ve written nice letters. I have paid over $50 worth of fines (2 occasions) simply because I got muddled with return dates, since we borrow books at different times. I am petrified of library books now!! I wish books still had due dates stamped into them. We just loose track of when they have to be returned…I guess it is my lack of order in the house! Well done for your clean record! I tried being nice to my librarian, and I was still fined when Tirzah ripped a novel’s page in half. I too took in proof that I could buy the book for new from Book Depository for much less than their damage fees, and they lowered the charge by half. Oh, Renee, you’re more forthright than I am. I tape up any torn pages and return the book without confessing… Hmmm… Am I going to feel convicted about this in the future? It is possible to return the case and for them to not notice a missing disc. On two occasions now we have put holds on cds, only to find, when we got them home, that the disc was missing and then when we go into the library to notify them they tried to make out that we lost it. We also check the cases before we leave the library now. And on multiply occasions (5 just this year!!) we’ve returned items (I keep a list and tick them off) only to find that they are not taken off our card and then we have to go through the “speaking to the head librarian” thing and explain that we did in fact return them the week before. It makes it look worse that this is not the first time this has happened to us. Several times I’ve been able to walk into the library, locate the book on their shelves and bring it to them to show that I did in fact return it. So perhaps you did return the case without the cd. If you had a look on THEIR shelves I wonder if you’d find the empty case still sitting there. It is a possibility.